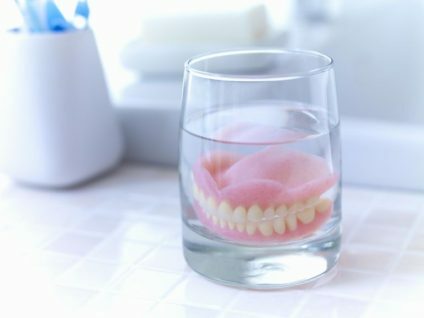 Dentures are man-made appliances used to replace missing teeth and they’re sometimes known as ‘false teeth.’ Dentures are made from plastic and molded to fit your mouth but they can feel uncomfortable and awkward for several weeks while you’re getting used to them. You’ll make more saliva, they’ll slip around just a bit and you may have a few sore spots while your mouth is healing. Adjusting to life with dentures may take some time while your facial muscles adapt to the new sensations, changes in your ability to taste some of your foods, plus you’ll need to learn how to chew with dentures. Start slowly and choose soft foods that are easy to eat until your dentures are settled in and you feel comfortable eating solid foods again. Start with a liquid diet that includes purees and soft foods such as apple sauce, puddings, cooked cereals, chopped boiled eggs and soup broth. Be careful with hot liquids and foods so you don’t burn your mouth. You won’t be able to judge the temperatures correctly due to the insulating quality of the denture. Don’t hold liquids in your mouth for a long time before swallowing. This can loosen bottom dentures. You might find that foods taste different with dentures. Your sense of taste should improve over time. When you’re ready to move on to solid foods, start with a mechanical soft diet. Be sure to cut your foods into tiny pieces. Distribute your food evenly on both sides in the back of your mouth when you chew, this will help keep your dentures more stable while you eat. Chew slowly and thoroughly before you swallow. Don’t gulp down large pieces of unchewed food because you could choke on them. Slice fresh fruits and vegetables into very thin slices or chop them into tiny pieces, so they are easy to chew or cook them before serving. Whole grain bread and cereals are good for you, but they may stick to your teeth. Eat them with liquids to make them easier to chew and swallow. Replace tough red meats with poultry, fish, eggs, and legumes, or choose stewed or slow-cooked meats. Denture adhesives may help for eating foods that require a strong bite (like corn on the cob), but you may wish to avoid very hard or very sticky foods. Take is slow for a while and remember a little soreness is to be expected as the muscles in your tongue and around your mouth get used to keeping your new dentures in place (using the right dental adhesive is so important, too). But be sure to keep your dentist updated if these problems don’t go away. Once you are fully adjusted to wearing and chewing with dentures, you should be able to eat almost anything. However, there may be some foods that will always be difficult to eat such as foods that are hard, sticky or contain small hard particles. Even with a strong mouth and well-fitting dentures, it’s a good idea to be careful when you eat whole fresh fruits, hard crusty bread, tough stringy red meats, peanut butter or almond butter, chewing gum, sticky candy, fruits, and berries with seeds, nuts and peanuts, sunflower seeds, and coconut. Eating a healthy diet requires the ability to chew your food, which isn’t an easy task if you’ve just been fitted with new dentures, but, as long as you follow our tips, plus some time and patience, you’ll be chewing and eating normally in a few weeks. However, if you have any problems such as mouth sores that don’t heal or continuing pain, or you just don’t seem to be able to get the hang of chewing with dentures, you can go to your dentist for help. Batisse C, Bonnet G, Eschevins C, Hennequin M, Nicolas E. “The Influence of Oral Health on Patients’ Food Perception: A Systematic Review.” J Oral Rehabil. 2017 Jun 10. Proctor and Gamble. “Fixodent Beauty & Aging Survey.” Published August 22nd – August 31, 2009. Touger-Decker R, Sirois DA, Mobley CC., “Nutrition and Oral Medicine.” Springer-Verlag New York, LLC. Published January 2005.